Here's a delightful taste sensation...see the New York Times article, and be sure to scroll down and watch the video of the people tasting the fruit. I want some. Would somebody please tell me WHY a refrigerator has an "OFF" setting? Call me crazy, but if you want your fridge to not be cold, don't you just unplug it? Nah. Couldn't happen. Or could it? ETA: You know, it looks like a regular high school graduation, but Libby has always been homeschooled. This is the graduation ceremony for the pre-college students at the conservatory she attended on Saturdays during her high school years. Just wanted to clear that up! And for the record, I almost held it together. The plan was simple: I was NOT going to cry! I knew she was graduating with Honors (she had been nominated for the junior/senior honors seminar in her sophomore year, and had enjoyed the college-level class), but when they called her name for one of nine surprise awards for Outstanding Achievement as well (one of only three students out of the 90 members of the class to get both), I totally cried. A lot. It was embarrassing. Libby didn't cry; she was too nervous about tripping over the gown. Afterwards, the final orchestra concert was received well--a rare standing ovation. Congratulations to all the graduates!!! Are Your Children Too Clean? See what The Scotsman has to say. This was a huge class to start, and these girls have been together since they were 3 or 4 years old (some of the boys were older, and graduated last year, and many kids dropped out or moved on). They made it through a trip to Europe together, concerts at Carnegie Hall, Donnell Library, Flushing Town Hall, and more! They have laughed and cried together over the mistakes that all musicians make. Here they are now, college and conservatory bound. It seems like such a short time ago they were tiny girls in frilly dresses at their first recitals. Time flies! BTW, the cake was delicious. Three Cheers for the graduates, The Suzuki Program, Mrs. DiCecco and Mrs. Broverman! This is the last piece from the recital, and Libby thinks it's the best of the bunch. From baroque Biber to modern Messiaen, Catholic composers for the violin enjoyed a mini revival last Saturday. This piece was recently rediscovered, and just published last year, so this is the local premier! ETA: Trip taped the performance, so all close-ups are his fault :) . Biber's Sonata XVI [Passagalia--"Der Schutzengel als Begleiter des Menschen"--sort of a wrap-up piece for the Rosary Sonantas]. The quality is not great, but the sound is pretty good, I think. She chose the piece for its meditative beauty...and to demonstrate the versatility of her new baroque bow :) . The book, which, along with the others in the series, I have read every year since I was 8 (and I will not admit how many times that is...), is about the rise of atheism. What the film lacks is a deliberate confrontation between faith and atheism. Sure, there were little hints, like when Aslan tells Lucy that just because her friends lack faith doesn't mean...blah blah. But that's a lecture, and who wants a lecture in an adventure film. In the book, that lecture is personal advice during a very confessional moment. You must do what you think is right, even if others tell you that you are wrong. Period. In the book, Miraz champions atheism, and Dr. Cornelius, who is the Narnian equivalent of a priest-living-in-hiding, is the teacher of the faith who saves Caspian from a faithless world. Miraz tells Caspian that he has been told fairy tales, and Caspian despairs; Cornelius tells Caspian the tales are true, and Caspian rejoices. Caspian is forced on a pilgrimage and finds the Truth, and the Truth, ultimately, defeats the faithless. We see none of that in the film, and that's a shame. The rise of faith, and of the faithful, is the real story in Prince Caspian. Prince Caspian, Is That You? Saw the film this afternoon. It was absolutely beautifully filmed. The cinematography was magnificent. The action sequences were great; the story flowed well. But something bothered me...the story seemed slightly familiar. It reminded me of a story with the same name by C. S. Lewis. In a few places, even the dialog seemed to have been taken right out of Lewis' book, though often, the wrong character has the lines. This film even has a lion, similar to Lewis' Aslan, but more distant and mostly absent from the film. In fact, the film starts off so well that I really thought that someone might have made a movie of Lewis' book. But shortly into the film, I realized that this was a nearly entirely made-up story that takes place in Lewis' Narnia, but lacks the charm, innocence, and clean precision of Lewis' classic. Reepicheep, most noble of mice, would NEVER say, "Shut up." Not even to a squirrel. Peter is not a brawler (he and the other children were sneaks and liars in the first film, so I guess that fist-fighting is the next anti-social step for Peter). Susan and Caspian do not kiss, ever; this was completely unnecessary. All other complaints are nit-picky little things...not enough Dr. Cornelius, no Nurse, no Silenus nor Bacchus, wild dance nor wine, no school boys turned into pigs, and no astronomy lessons in the high tower; too much arguing between Peter and Caspian, too many silly mouse jokes (though overall, Reep was well done! ), and way too much liberty with the story line. But it was good in some unexpected ways. It was, in fact, a bit like a totally new Narnia story, with more depth of character in the Telmarines, greater landscapes, more manly kings, creepier villains, and more complex story twists. The film is long--2 hours and 20 minutes. Looking at Narnia for this period of time is a delight in itself, and if nothing else, Narnia is Narnia in this film. The river god, the hag and werewolf, the centaurs, the animals, the Telmarines, the ruins of Cair Paravel and Aslan's Howe, were all near perfection. Here, the director's vision was close to Lewis', and, ultimately, provides us with the satisfaction we all crave when we peek into that other world. It also proves that someone read the book carefully enough to get the setting right. So see it, support it, and let's hope the Dawn Treader will steer a course closer to the story line. For celebrating Children's Book Week! 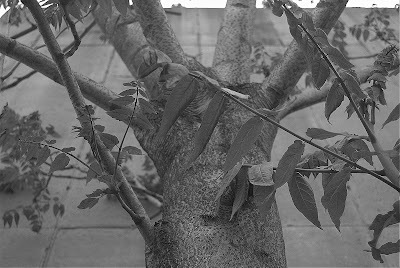 Trees that grow right up aganst a concrete wall are just amazing. Special thanks go to Dr. Yarrow for giving Libby plenty of performance experience. And thanks to all the orchestra members for hard work and support over the past 6 years. I've got a bad feeling about this...we offered these flatworms (center) an earthworm (far left) to see if they are the invasive kind that eats our annelid friends. The jury is out. ETA: The jury is back. Death penalty. "These are frozen elder flowers," he said, reaching into the canister with a small scoop and sprinkling tiny white nuggets into my dessert bowl. "They have been chilled in liquid nitrogen." There's more; read it all. ...and get serious in Act 3. Sir Andrew makes a dramatic entrance. The director gives advice to Sir Toby as Viola and Antonio look on. And we are not the only ones! Buzzing about the blogosphere, we find that Mrs. T is blogging Julius Caesar, and The Bookworm is in Stratford! Even Ignatius Insight is talking about the Bard (with Joseph Pearce!). As a family, we have not been to a movie theater in quite a while. We were stunned when a movie and popcorn for 6 was nearly $90. We won't be going again soon (Prince Caspian is not Don's thing, so we might have just the 5 of us go). Ah, but Expelled, the documentary by Ben Stein, was worth it. He keep us interested with his signature low-key humor and good-natured curiosity, with frequent laughs punctuated with somber thoughtfulness. His question: Can Intelligent Design be engaged by the intelligent, or does interest in ID guarantee a pink slip to its academic adherents? Stein lets both sides be heard, interviewing proponents of both strict atheistic Darwinism, and ID. The interviews are punctuated with film clips and brief comments about faith, atheism, Darwinism, academia, the Holocaust, eugenics, and more. Stein asks the hard question: What's the big deal about ID that the likes of Dawkins and others find it so abhorrent? Hmmm? Until this film, I had a good deal of respect for Dawkins in his own field (evolutionary biology), though I find his atheist musings both tedious and offensive. But this film showed Dawkins for exactly what he is--a bigot who is anti-religious to a point of absurdity. I don't want to give away the scene where Dawkins calmly demonstrates that he is a bit of a nutter, so I'll just say that the whole theater burst out laughing as he told us all his idea of how life started. See this film. "I knew my destiny when I first visited Yosemite." Read more. 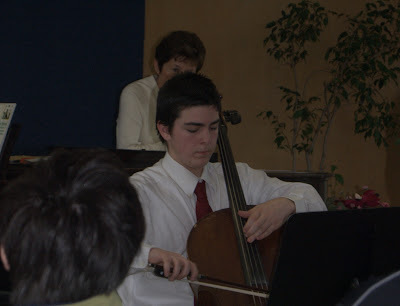 Trip's recital. Nice job, Trip! Haydn C was a great choice. Case in point: Last week, while we were visiting, she declared that a tree on her property needed to be removed. At my age, I know better than to argue, and besides, she didn't say when it needed to be removed. A few minutes later, her tree-removing pals "Oma" and "Opa" (good friends, really!!) swung by with a chainsaw, rope and a Jeep. OK. They are here to remove the tree (a cedar) now. My brain reeled. It's spring...I know there is a good reason not to remove trees in spring, but what...oh, goodness, they are already here and ready to start. Too late. A few minutes later, as the first branch fell, a dove came flying out of the old cedar. Libby saw it and looked to the ground; sure enough, there was the dove's loosely formed grass nest, with two little white eggs, one cracked, one perfect, sitting on the lawn beside it. Yeah. That's why you don't remove trees in the spring. I gave my mother the look. She winced. WE left the nest in a nearby bush, pretty sure that the dove would not be back, and that the raccoons would have a (very) small treat. On the bright side, in order to take down the main trunk in a way that would avoid the houses on either side, I got to pull the tree with Oma's Jeep. It was actually kind of fun, driving the Jeep into oncoming traffic with a rope tied to the better part of a 40 foot tree as it came crashing down behind me. "Drive!" yelled Opa, as the tree slowly leaned towards the back of the jeep. My mother stepped out into the street to entreat the traffic to slow...but to no avail. The tree narrowly missed the Jeep. The Jeep narrowly missed the truck. The truck narrowly missed my mom. Fun! Back at home, we were delighted to find that a dove was nesting in our dogwood. Again, the loose gathering of grass and light twigs gave away the occupant's identity, and we saw the bird sitting on the nest shortly thereafter. The nest is right outside the window, so we can watch it, and see any hatchlings as soon as they pop their little heads up looking for food. The dove is a lovely addition to our yard. Last year, T, unfortunately, has a nest of mockingbirds right outside his window. Anyone familiar with this noisy bird know that they sing in the middle of the night, and the babies "peep" sharply at dawn. Still, it's always a treat to see nestlings develop and fledge.